I hadn't used my WaMu credit card since the first quarter of 2006. Back then, it was a Providian credit card. But then Washington Mutual (WaMu) bought Providian, and, just recently, Chase bought WaMu. Now, the reason I wasn't using this card is because a) it didn't have a competitive interest rate for purchases and b) the rewards program attached to it wasn't anything special. I had plenty of cards to choose from, so why would I choose one with a high APR and a very ordinary rewards program? I used this card to take advantage of an attractive 0% balance transfer deal, then, when the interest-free period expired, I paid the card down to zero. I kept the account open because the $11,000 worth of credit available to me with this account was helping to keep my credit score high. Another reason I liked having this account was because I had free access to my Bankcard FICO credit score (provided by TransUnion.) No other card in my wallet (and I have plenty) offered this unique benefit. I wasn't happy about this. First of all, my FICO® credit score would likely drop due to the decreased amount of credit available to me. Second, I liked having free access to my credit score. Who wouldn't? So my first reaction was to try and use the card to see if Chase had deactivated it yet. I tried to buy a song from Amazon ($0.99) but the charge didn't go through. Next, I called the customer service number on the back of my card. Despite the late hour, I was able to talk to a customer service representative (CSR) right away. I asked the CSR to reactivate my card. I told him that I wanted to do some Christmas shopping with it immediately (which wasn't a lie. I would have spent some money on the card to keep it open.) The CSR said he couldn't do it (listen to the MP3 audio here.) He explained that WaMu had closed 1.3 million inactive accounts. The CSR anticipated that I would complain about the negative effect this action would have on my credit score, so, before I could say anything, he went on to say that this action, "will not appear as a negative mark on your credit bureau report." I complained a bit, then he explained that because the account was closed due to inactivity, and because my account had a zero balance, I had nothing to worry about. I did not see any point asking for a supervisor, but I did call back a few hours later (their CSR's are available 24/7) to see if I would get a consistent response to my reactivation request. The second CSR gave the same canned response to my appeal for reactivation, but also added that I could apply for a new WaMu credit card account if I wanted to (MP3 audio here.) This suggestion made sense to me even though I wasn't happy about it. The "don't worry about it" nonsense that CSR #1 gave me was insulting, because we both knew that my score will be affected. I'm just going to hope that the ding to my score is a mild one. My credit score is 804 right now and I want it to either stay there or rise. So, should take my time and find a really great credit card and apply for it? Having thought about it for a few seconds, I've decided to apply for another WaMu (Chase) card, because I want my credit score to stay high and I want free access to my score. According to the WaMu website, all WaMu cards still provide free access to the accountholder's FICO. 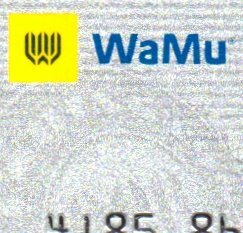 I found that I can still login to my WaMu account online, so I visited WaMu to see if they had any credit card offers ready and waiting for me. I found no offers in there. I will try to find a good WaMu card and apply for it. I'll post again after my application is processed. Now what kind of lame brain lender doesn't make it as easy as possible for a highly qualified, long term customer to borrow money? It's a real wonder why the banking industry is on it's head, huh? Considering your post on the "Money As Debt" series, I would think that the $11,000 in credit that you once had available should have been readily extended to you when you said that you had plans to spend right away. However, I must also conclude that they may feel that anyone worth taking a risk on could simply reapply and be approved under the more stringent lending criteria that are in place in this post-bailout era. off subject, but did you know that 51 percent of Citi bank is owned by Saudia Arabia in a soveriegn investment fund??? with the stipulation that they do not have any votes on the board? Prince Alwaleed bin Talal bin Abdul Aziz al Saud owns 3.9% of Citigroup, while the sovereign wealth fund of Abu Dhabi owns 4.9%. I just found out right now that this same thing happened to me. I originally had Providian which became wamu. I loved the FICO score access. I call the rep today and they said they closed it back in Nov. because i do not use my CC. I am wondering the samething. Will it affect my credit score? I have an 838 credit score the last time i check. i wonder how hard will this hit me... i figured i will not apply for another card because the same thing will happen. im not going to use it and it will be closed again. i don't think it's right for them to just to close my card like that. they said the it's on the agreement that they can close the card anytime they like. I should of ask them can they send me those papers that I signed that said that. but i figured, why argue over spilled milk. I'm happy to report that I can still login and check my TransUnion FICO score under the Credit Profile tab. Score should update 7-8 days from now. I'll post again next week with an update. Yep! I got my letter yesterday. My WAMU/CHASE interest rates will jump to 31.99% in February if I continue to use the cards...and have good credit! Same crap Mr. Pritchett pulled when the card was known as Providian. He contnued to run WAMU cards, and my bet is he is still running ithem! Gonna put WAMU in my rearview mirror! Traditionally, Chase is a very expensive bank for the average Joe-shmoe to deal with. My WAMU credit line is $16,400, a FICO score of 830, and I average about 30 to 40 transactions a month on the card. For the past several months, I've paid my balance off in full, every month. My current purchase rate is a remarkable 5 percent. I just got a letter from Chase raising my purchase rate to 10.24 percent. People with a high FICO score should be able to do better than a 10.24 percent purchase rate. I will continue to keep this card to monitor my FICO score. I do not trust Chase. I do believe that eventually that we will loose access or free access to our FICO score. I'm also going to cash in my points, as I'm sure that Chase will tighten up, there, too. The answer is, if possible, pay down & off in full each month. As their old ad slogan was, "You have a friend at Chase Manhattan". For someone who has a credit score of 830, 10.24% is so clearly unreasonable that you have to assume that Chase simply doesn't want your business anymore. Prime is 3.25% right now, so your rate is Prime + 6.99% = subprime. Makes me sick to my stomach when prime borrowers are treated like subprime borrowers. Hello Credit Cards. You are correct, the letter said prime + 6.99%. Luckily for me, since I have a zero balance, I am not wedded to Chase. As I said, traditionally, Chase has always been an expensive bank, people of average walks of life can easily do better at other banks. I predict that Chase will tighten up the old Wamu card further. I predict even higher rates & fees. I predict that free access to our FICO score will either become fee-based or ended. I predict that the rewards program will all undergo changes, fee based and/or less rewarding terms. My Wamu card is turning from a beautiful butterfly to that of a sewer rat. Oh well, nothing lasts forever. Credit cards are very profitable for banks during the good times. But now that we're in an oppressive recession, and the market for securitized credit card receivables has dried up, banks now see credit cards as the wayward stepchild of their family of financial products. I think banks are going to take all that cheap cash they got from you, me, our kids and our grandkids (TARP), hoard it during this recession then start behaving like banks again when the economy starts to improve. So let's hope this contraction doesn't last as long as the pundits have been predicting. The Free FICO score will be gone once the WAMU online systems are moved over to the Chase website. I doubt we'll ever see it again. I fear Chase will tighten or eliminate the rewards program, Chase is eliminating everthing else that was good with Providian/WAMU. Here is my question I want to get a new card from a good bank that has good incentive programs - any suggestions of where I should apply? The Discover More card has the best cashback rewards program, IMHO. Got my Chase letter for 31.99% today. Also note that FICO score goes away March 1 as the WAMU site closes and Chase opens. Juniper VISA with Barclays Bank has a credit score from TransUnion free every month and 8.99% APR. That's cool. I thought WaMu was the only bank offering this benefit. However, for those who might need to actually use this card as opposed to just having it for the free credit score, 8.99% isn't that great. Prime is at 3.25% right now. Information in this website is provided for educational and/or entertainment purposes only. plans, first or second mortgages, credit cards or car loans.